Commemorative: a stamp that was made to celebrate something special. These stamps are sold for a limited time only. VF-Very Fine ……a perfect stamp, very well centered. Die-cut: a stamp that doesn’t have to be separated by hand along its perforations, it has been pre-cut so that you just have to peel it off its backing paper. Sometimes the edges of a die-cut stamp are wavy to make the stamp look like it has real perforations. Error: a really big mistake that has been printed on a stamp. Sometimes the picture is missing, or a color is missing, or the perforations are missing. Usually, there are very few stamps with the error. Fake: a real stamp that has been changed to make it look like a different and usually, more expensive stamp. Sometimes people add colors or add to the picture on the stamp. Forgery: a stamp that is not real and that was not made or printed by the post office. 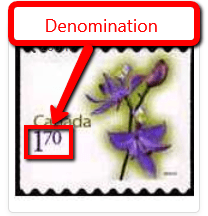 Dishonest people make these stamps themselves so that they can sell them and make money, but they are not genuine. Gum (gummed): a type of adhesive (glue). Usually gummed stamps are water-activated, in other words, you have to lick them to get them to stick to the envelope. Hinged: a stamp that used to have a little piece of paper attached to the back of it so that the collector could stick it in his album. Usually a hinge leaves a mark on the back of a stamp even when it is removed. Mint: a stamp that has never been used, or put on an envelope. It is in perfect condition with no marks on it. 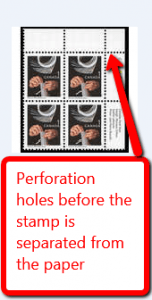 Perforations: when stamps are printed on large sheets of paper, holes are punched out along their edges so that you can separate them from one another. After you have separated your stamps, these holes leave a wavy edge all around the stamp (see picture at left). 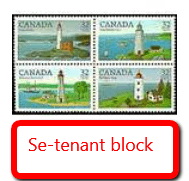 Plate block: a block of four stamps still attached to one another, that was taken from the corner of a large stamp sheet. These blocks also have some selvage still attached. Self-adhesive: stamps that are sold with the glue already on the back, they are like stickers. 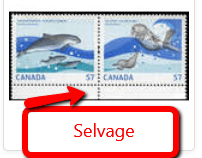 Selvage: the margin of paper that is left when you detach stamps from a sheet of stamps. Some people like to collect blocks that still have this paper attached on two sides. Unused: a stamp that was never used to mail an envelope and that doesn’t have a cancellation, but it is not perfect like a mint stamp. Maybe it has a hinge on it, or some of the gum is worn off. Variety: a stamp that has a small mistake on it made during printing. Usually, many stamps can be found with the small mistake. Watermark: a kind of mark embedded in the paper of a stamp that is invisible to the naked eye. It can only be seen by putting a special liquid on the stamp, or by shining a light through the back of the stamp.